Q: How did you end up at Kibler & Kirch? A: I started as an intern during college when Rosina and Erica owned Kibler & Kirch, then the next year I interned again for Jeremiah and his family. That was five years ago. I’ve worked here five years! It helped me so much to start from the bottom. I learned everything there was to know in the library (our library of fabrics, samples and looks from each company) before I even started designing. I was really fortunate to get this job right after school I couldn’t have found a better fit. We all say it, but Kibler & Kirch is truly like a family (and not just because her sister Kelsey is our Business Manager). Q: How did you know you wanted to be a designer? A: Of course as a little girl I had dolls, but I didn’t really “play dolls” with them as much as I made houses for them. My mom had a bookshelf she let me paint. I painted the levels in different colors and pretended each level was a different room in my dolls’ house. I created a separate space for each mood and activity they were doing at the time. When it came time to go to college, I made sure I went somewhere with a great interior program that focused on both the art and technical skill of design. Q: What type of design work would you consider your specialty? A: I love residential work, creating spaces that make our clients feel at home. While I actually really enjoy the beginning stages of designing a home, picking out fabrics and figuring out a furniture plan, I also work with our retail side (Kacey does a majority of our store merchandising) that I’ve become really great at putting on the final layer. That’s why I enjoy Design-for-a-Days so much too. I love working with the bones of what people have or have ordered from us for a remodel and then using just tiny details and accents to really pull the look together and take it to the next level. Art and accessories makes a home so comfortable to live in and are a great way to show off our clients’ personalities. Room wise, I like decorating bedrooms and living rooms. It’s so easy to play with bedding and change up the feel of a room. And living rooms there is almost an endless amount of options in furniture to create a look that is both fun and functional. Q: What would you own dream space look like? A: I don’t know if this is common with all designers or just me, but because I’m around so many options of fabrics and colors all day I’m really drawn to neutrals in my own home. Partly because there are so many fabrics I love that if I had to pick just a few for my own house, I’d go mad. I remember Rosina (our founder) saying one time she needed help picking out her sofa fabric. I mean, it’s Rosina, she’s been doing this for so many years, but you still want another professional’s help. It’s much easier for me to take myself out of it and choose things that will make my clients happy. How did you join the Kibler & Kirch design family? I interned at Kibler & Kirch when I was in college. I’m from Red Lodge and grew up going to the store. I started working here full time when I graduated from the University of Idaho with an interior design degree, minor in architecture and became an Allied ASID Designer. I would be a desk! A place to sit down and let the creative juices flow and accomplish things that need to be done. What do you own that you would never get rid of? I’m never getting rid of my grandmother’s turquoise ring. I fought my sisters for that one since we were little and playing dress up. I’ll give them anything else but that ring means the world to me. I like different parts of every style, which helps me relate to whatever look my clients want. Every style has something intriguing about it. Personally, I combine them for an eclectic feel. Growing up, my mother loved houses. I spent many Sunday afternoons going with her to open houses, looking at floor plans, and analyzing natural light and overall design. I grew to love being able to take a house and turn it into a beautiful home. I have also grown to love picking up a tool and helping a vision come to life as my DIY skills have increased. I come from a background in HR and Business Management but I wanted a job that would let me stimulate my creativity sufficiently to keep me happy and interested in my job for long term. I knew that what I really wanted was a job that would let me use my creativity, organizational skills, and people skills all in one. When I saw the job posting for a design coordinator at Kibler & Kirch I knew that it was the perfect fit. I am surrounded by amazing people with incredible skill and I love that I get to be a part of creating beautiful spaces. I would most definitely be a lamp/light. Nothing is better than good lighting. I love it when people let their personalities shine and I strive to do that every day. Lamps also come in an endless variety just like people. You have to LOVE a good lamp or light fixture! They are like the icing on the cake! Scrapbooks! There was a time when scrapbooking was my creative outlet. All of the way back to my high school years I kept a scrapbook to remember homecomings, proms, and general teenage shenanigans. As the years went on my husband and I grew our family to include four children. Much of their early years are chronicled in handmade scrapbooks that I spent endless hours on. Not only do I love looking back at them but so do my children. I have to say that I am probably somewhere between eclectic and transitional. As someone with a large family I feel that things need to function first but that beauty comes in a very close second. I gravitate towards spaces that have great architecture, lots of light, and that are welcoming and warm. Dominique, one of the longest standing Kibler & Kirch employees, lives immersed in nature on a daily basis. She does surveys and wildlife counts for Cornell, Audubon, and the US Forest Service as she searches for inspirations for her work. For us, she specializes in furniture repair, faux painting, and making things more perfect. When Dominique heard that her painting was selected to be shown at the prestigious Birds in Art exhibit at the Woodson Art Museum, she knew it was equivalent to winning a gold medal for wildlife artists. Her piece, “Communications,” will be on view in the Wausau, WI museum alongside other masterworks of bird art before joining an international exhibition. “Communications” was sparked by a trip to the Post Office, though. As she walked the alley behind our store, she saw the myriad of telephone poles, satellite dishes, cables, and TV antennas that become nesting points for ravens, who adapt to changes in technology and environment as easily as humans. Over one year later, she completed her work that, she says, expresses the communication between and amongst nature–even in town. Way to go, Dom! My husband and I moved from Northern New Hampshire to Red Lodge after years of coming to the area on backpacking trips. Being a wildlife artist, Montana is heaven … but we arrived without jobs. I was a former art teacher and librarian but could not find work in those fields, so I did sheet rocking. An artist friend told me about an opening at K&K, where I began as a retail person. My job description continuously grew, as I added ore artistic tasks to my list. After 17 years, my presence on the floor is much less, doing shipping/receiving, painting, faux painting, refinishing and repairing, etc. Having an art degree has always been an asset in design and color, and art history in combining styles and periods. I would be a painting easel, always have a part of creating, always changing with splatter and drips layering the history of my interactions in nature’s ways. My 97′ Toyota 4-runner. It has a manual tansmission, 4-wheel drive, crank windows, four cylinders. It’s the perfect vehicle to haul art supplies and artwork, and to camp in. Contemporary rustic with its clean lines, uncluttered in natural warm materials. I feel like I was always a part of Kibler & Kirch–from the moment I walked though the doors when I was in high school. Fate brought me the opportunity to run this amazing company many years later. I have big shoulders to stand on and many amazing people at my side. If I said “I’m living the dream,” would it be cliché? A wingback chair in a proper menswear fabric. I’d be timeless and outlast the other things in your home. A folding wooden ruler that was passed down from my great grandfather to my grandfather–and then to me. It’s worn smooth and inspires me to do work they’d be proud of. It always makes me think hard about quality. I like a subtly Western experience. It has to look gathered and collected, though. There are so many beautiful furniture pieces in the world that it’s impossible to stick to one style. I find ways to put things together you wouldn’t expect. I have known Rosina forever. I had been a secretary at my church for seven years part-time, and when our oldest was going to college I decided to get a full-time job. Rosina came to me and we stayed up until midnight talking about me working for her. I started two weeks later. I always felt like it was a God thing. I would be a cozy chair that you could curl up in and feel like you were home. Nothing material, just my family! I love a lot of different styles, but I always gravitate to vintage and cottage charm. In 1990, I was working with one of the original founders of K&K in Red Lodge. She was excited about a new venture that was to be Kibler & Kirch, but since the original gals had full time jobs they didn’t know how they were going to manage the store seven days a week. I said I’d work a couple Sundays a month if they needed me too. That was 25 years ago! When I retired from my full-time job five years ago, I asked Erica and Rosina if I might be able to work more. Now I do and I get to meet new people from all the world! The rest of the week, my husband Jim and I tend to the flock of sheep and our chickens, garden, play with our two grown daughters, son-in-laws, grandsons and grand-dogs. Life is good! I would be a nice swivel rocker with a down back pillow. After a long day of work or play its owner could come in, relax and read good book. I have a chair like this from K&K and love it for that exact reason. I recently graduated from the Interior Design Program in Bozeman, Montana, and looked for the perfect job that would set my design career in motion when I ran across Kibler & Kirch. I researched the company and fell in love with the way they make architecturally stunning spaces feel comfortably lived in. A coffee table. When my family gets together, we usually end up in the living room. Many wonderful conversations have happened around my parent’s coffee table. I love being surrounded by all my loved ones. My great grandfather’s sofa. My parents had it in their bedroom ever since I can remember – and my siblings and I would sleep on it when we were sick. I just inherited it and can’t wait to have it refurbished for my house! I hope it will become a statement piece that is flexible enough to carry from house to house. I love using multiple different styles. No two spaces are ever the same! I feel that you get a sense of which styles your client connects with most. Combining different styles for each client is what makes the job so interesting. I am an original member of the family. Kibler & Kirch was a dream inside my head before it was a store. I remember going to market in Highpoint with a family friend and seeing this vendor’s booth that had been set up like someone lived in it. There was popcorn in the bowls, magazines folded over like someone just stepped away from reading it—it even smelled like a home. 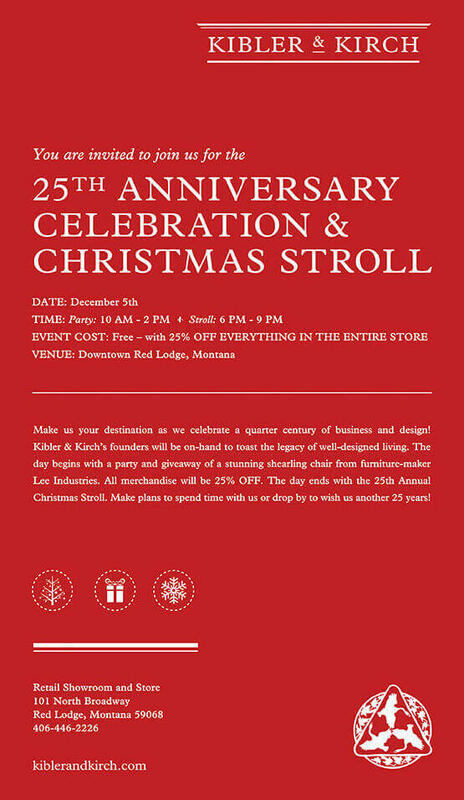 That stuck in my head until we opened Kibler & Kirch 25 years ago. We made the store feel like you could just buy the whole room and transport it into your home. I never did see that showroom again. It’s like it was there just to inspire me. I had wonderful partners who rallied behind Kibler & Kirch and we built the company together. A bookshelf, because I love all of my books and wish I had all the knowledge on the shelf inside my head. I have a little brown pitcher from my great grandmother that she got when she was a girl from an older neighbor when she passed. She told my great grandmother to keep it and fill it with wildflowers before requesting that my great grandmother open the window to let her soul fly free when she died. I’ll eventually pass it to one of my granchildren. As our handmade rug expert, Mike has helped countless homeowners and designers through the process of selecting the perfect rug. I began working for Kibler & Kirch during high school and continued through college on my breaks helping both in the summer and during year end. I joined the team full time shortly after obtaining a dual degree in Marketing and Management with a minor in Economics from the University of Nevada, Reno. If you were a piece of furniture what would you be and why? A rug—I would like to think that I am a stabilizing member of the Kibler & Kirch team. One of the many building blocks to help make our clients and customers experience more enjoyable. What one thing do you own that you would never get rid of? My great grandparent’s wooden antique bed. With its unique carvings and intricate details it is surely a one of a kind piece that has been in our family since my great grandparent’s wedding, given to them as a gift, around the 1890’s. I am attracted to a variety of styles. I find it enjoyable to mix different components to create my very own space.